It is especially difficult to resign from a job you like. This letter includes sample language with which to thank a boss or coworkers for an excellent work experience. 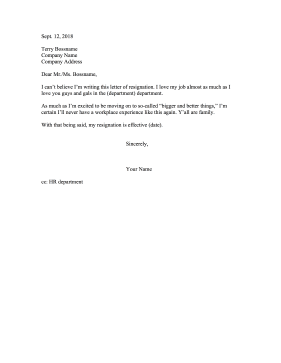 I can't believe I'm writing this letter of resignation. I love my job almost as much as I love you guys and gals in the (department) department. As much as I'm excited to be moving on to so-called "bigger and better things," I'm certain I'll never have a workplace experience like this again. Y'all are family. With that being said, my resignation is effective (date).